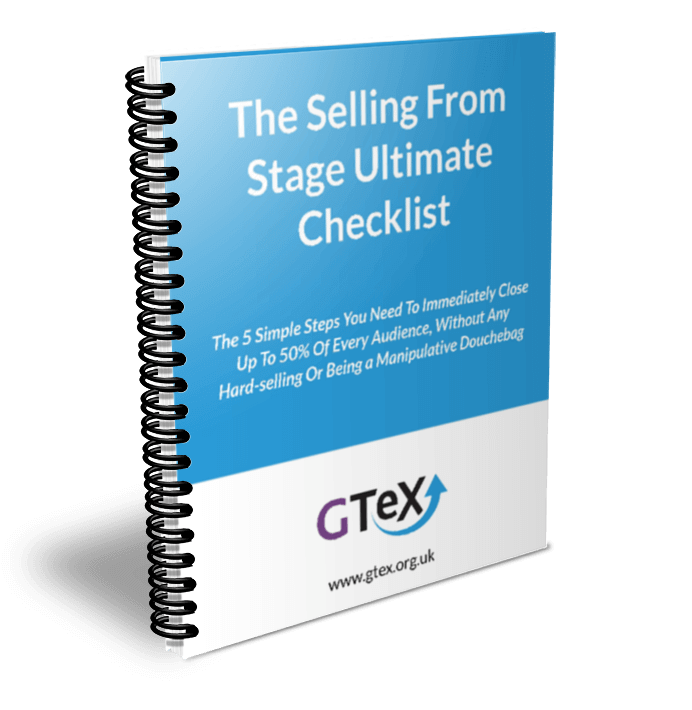 Download Here The Ultimate Selling From Stage Checklist! 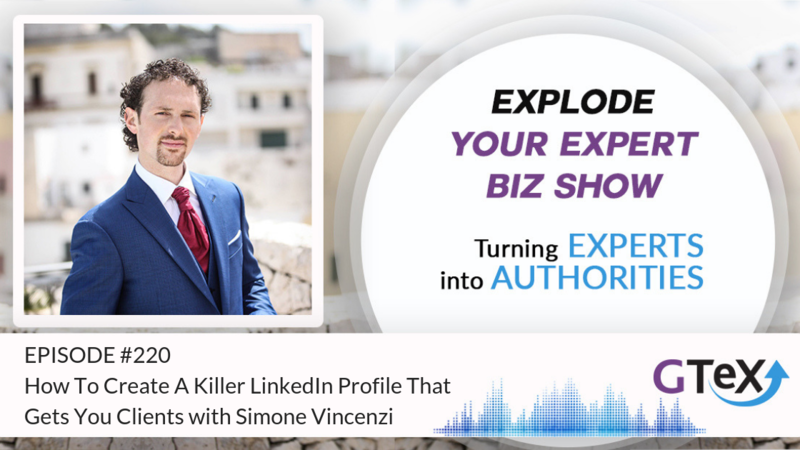 I am your host, Simone Vincenzi, The Experts Strategist, and this is the podcast for experts who want to become the ultimate authority in their niche while making an impact in the world. If you want to make 6 figures presentations and become awesome at Selling From The Stage without compromising your integrity I have created The Ultimate Selling From Stage Checklist. The most comprehensive checklist to create a pitch that sell without being a douchebag. 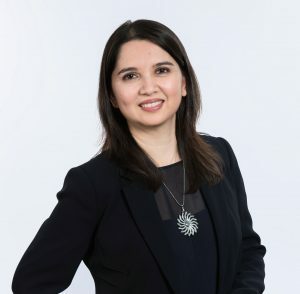 Rohini believes you are unique and have the potential to do extraordinary things in your lifetime. But first, you must discover what makes you unique and how you can make a difference. That clarity of vision is the first step in creating your own breakthroughs. How to achieve extraordinary things and make a difference in this world. Also, make sure you subscribe to the podcast so you don’t miss any other episode. 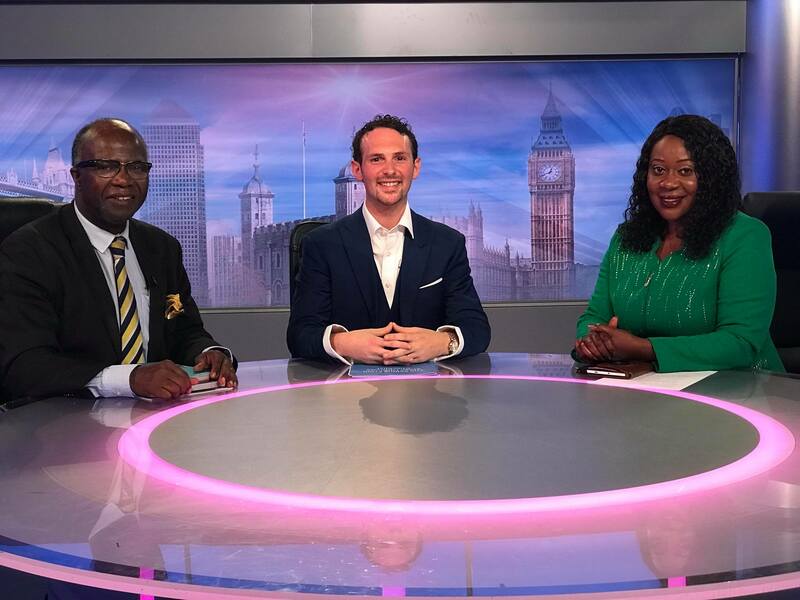 If you want to reach out to me with your questions, you can email me at Simone@gtex.org.uk that comes right to my inbox. 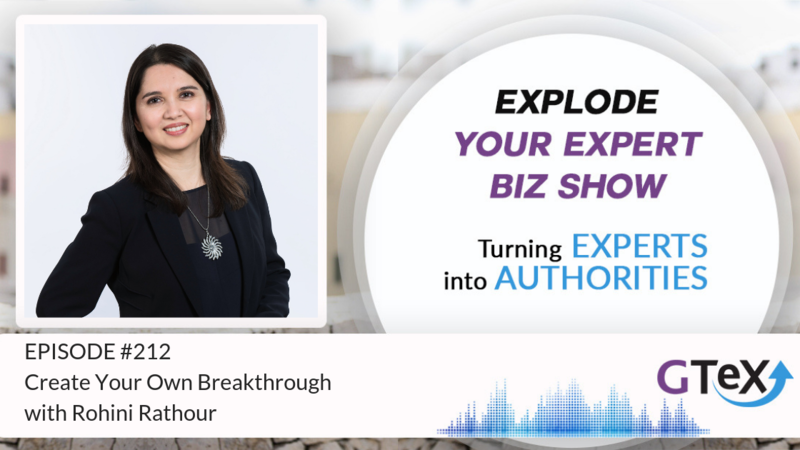 – Ladies and gentlemen welcome to another incredible episode of Explode Your Expert Biz Show and today, we are here with the awesome Rohini Rathour. How are you doing Rohini? – I’m really good. Thank you so much Simone. – Finally we made it happen. This episode was supposed to be recorded in September, then we had a Wifi issue and now we’ve made it. So I’m really, really, really happy that we are managing to make this interview happen. In particular because I love the topic we’re going to talk about, which is going to be Creating Your Own Breakthrough. And as business owners, entrepreneurs, experts, we are running our business is like a breakthrough day after day. And it’s about being conscious as well. How can we create this breakthrough so we can take our life and our business to the next level? So, before we get started to how to, let us know a bit more about your journey and what got you here. 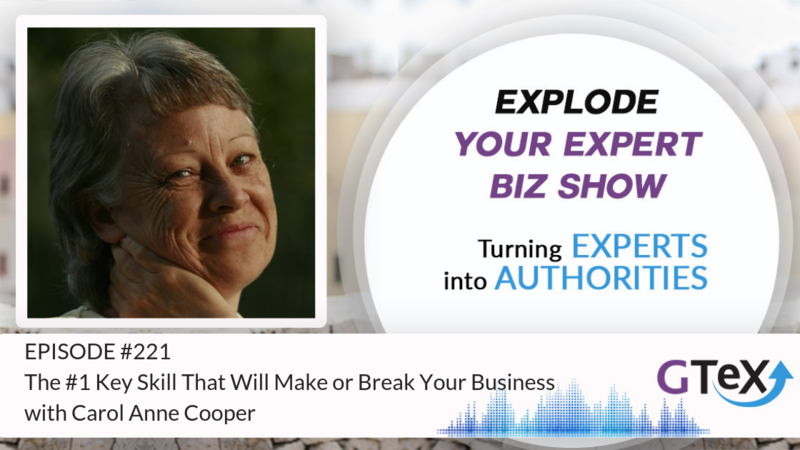 What got you to create your own breakthrough starting your own business? I’m really curious to hear that. – So I think that life is a series of breakthroughs for all of us, isn’t it? But some are maybe more meaningful than others. 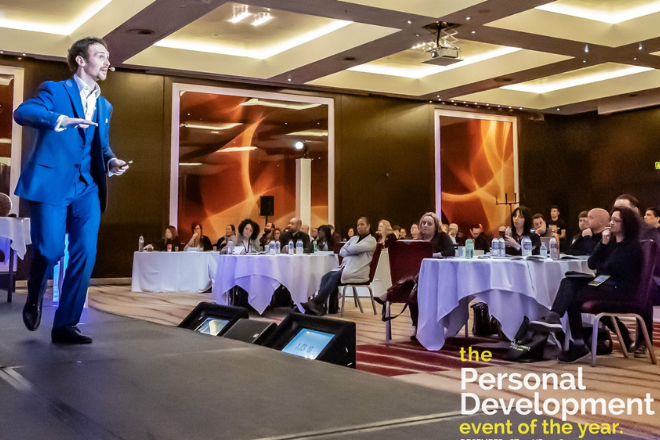 So in terms of how I got to where I am today, which is what I do as a personal development coach was that I had a career which I actually thought was going to be for life. I worked in the city and I did a job that I really loved. I couldn’t imagine that I would be doing anything else. But there came a time when actually I looked at my life and I thought, I’m not really loving this the way I used to. – What job were you doing? – So I used to work for a wealth management company and I was responsible for the investment of client’s money and a number of our times were charities, some were pension funds. And so I was actually head of UK Equities, which meant that I was responsible for the investment performance of money that went into UK stocks and shares. It was a great job. – It was not a small responsibility at all there. – And figure it out. – And figure it out. And so that’s kind of how it happened. – I know you had like while you were building your business, you had a very interesting hobby which actually was a business as well and I think you are still doing it. Can you tell us a bit more about that hobby and how that came into place in that period of transition? – Yeah so, you’re talking about my hula hooping. – I’m talking about your hula hooping, yes. – Yes, I actually came to be hula hooping quite late in my life. I was in my 40s, I was probably 42 and I discovered this little plastic ring that my kids were playing with and I found it almost impossible to keep it going. I looked at my daughter, she was only 10 and she was doing it with such ease and it’s kind of like this bug bit me. I’m gonna crack this. I’m somehow going to learn how to use this. And it started a journey because it coincided with at the time my wanting to set up a charity to help a group of children in India who were very, very poor and had some mental challenges. So anyway, long story short, I thought what should I do that’s really wacky but challenging to raise money for this newly reformed charity? And I thought, I’m gonna teach myself to hula hoop and then I’m going to hula hoop nonstop for four and a half hours. And so that’s how it all started and from there, I just basically took the hula hooping and I did lots of fundraising events. And then when I actually stopped working and I had a bit of time, I thought, what can I do that’s quite fun that I actually love doing and I thought, why don’t I train to become a hula hoop fitness teacher? And so I did that and then I set up my workshops and it was never intended to be my main business. So any money that I was gonna make from that, was going into a separate pot which was going to my charity or to other good causes. But actually Simone, I think what’s interesting is that setting up a business without having the motivation to make money for myself was a really good early lesson on how to set up a business when it came to actually wanting to make it my main career. So I think in terms of breakthroughs, maybe that was a breakthrough for me. – So tell me more. Tell me more about that because from the city to hula hooping instructor to setting up a business and not the financial, let’s say the financial goal immediately. That wasn’t the most important thing. So you said that there was a breakthrough for you. Tell me a bit more about that. What was the breakthrough? – So the breakthrough was that when I was in employment, obviously I was doing a job and I had a number of aspects to that job. So it wasn’t like, just one or two things. But there were teams of people who did other things. Like the marketing was done by other people. The finance was done by other people, compliance. So there were these teams of experts who did things that made the business work. When you start your own business, however small it is, you have to do everything. I mean, you know this and all your other members at GTEX know this very well and that’s not always easy because you may love one thing. I mean the hula hooping, I loved that’s why I went into setting that up. What I didn’t initially love was that I had to market myself, I had to face booking a hall, going there, nobody turning up, those kinds of things. But having said that, I already started a lot of my own personal development to understand how to deal with those situations. I had a really good mentor in terms of the lady I still consider my hoop idol, who taught us about how to deal with situations like that. And actually I learned so much about customer care and how to consistently show up, even if there’s one person. Show up and give them such a good experience that they wanna come back. – And so I think those things are things I’ve carried forward into my coaching business. I also learned how to use various habits of software to create my own cool marketing material to create a brand, to create a logo. So yeah, that’s what I mean by breakthrough. But you know if it’s not, there was no desperation there that I have to make so much money and if I don’t, oh my God, what’s gonna happen? So actually that was good because it allowed me a chance to learn and fail without having massive consequences. – Now this is such a great sharing because a lot of people forget first of all, how many transferable skills we already have maybe from other experiences. Like for you, you took the skills that you learned while setting up your hula hooping classes to then launch your coaching business. But also, I want to make a point around pressure because in this industry, there is a lot about, cut all the bridges. If you don’t have the money, that’s when you’re going to motivated to make money. But actually for a lot of people, this works exactly the opposite way. It puts them in the panic zone and I remember that when I was struggling to pay my rent, there was no space for creativity. There was no room for thinking about, okay, what can I do next that can wow my clients? It was all about survival. Where can I get my next client? That means that I can eat tonight and still pay my rent. And so that’s a great point you’re making on if you’re starting out your business, maybe you gotta find out about yourself. There are some people are more focused and productive if the cut all the bridges. But if you’re the kind of person is driven by security, have the security around you and just allow yourself the time to figure it out. – Whether you make it or not, it doesn’t make a difference. But at least you’re learning throughout the process, so thank you for sharing this. Very important Rohini. I’m curious now to know from you in your life, because we are talking about breakthroughs. So I’m gonna be personal here. What was your biggest breakthrough, the one that you consider to be your biggest breakthrough in life? – I think for me, gosh, there’s several, but this is one I think it’s only recently I’ve looked back and I realised that was quite a big breakthrough for me. So as you probably know, Simone, I came to England as an immigrant. So I didn’t grow up here and I struggled because I thought I was good at something in India but then when I came here, I realised that those skills were not quite transferable They were right for that ecosystem, they were not right for here. And I had this gap of not understanding what I was good enough to be doing. So it was quite a long period of discovery and learning. And I was going through a phase where I didn’t really want to get stuck into a permanent job that I didn’t like or felt that it was the wrong one. So I did lots of temporary jobs for quite a long period of time, nearly five years. And during that time, I was applying to the city because I wanted to get into finance either as a research analyst or as a fund manager and I had this one job interview that I still distinctly remember. And you know what they say about how women, when they see a list of six things on a job specification, if they can’t do one, they basically won’t apply, whereas I decided I wasn’t gonna be that person. There was one thing on that job description I couldn’t do and I thought it’s only one thing. I’m gonna apply for it anyway. And that one thing was a working knowledge of Visual Basic Macro. I don’t know if you know that is. So it’s like sort of low level programming skill on Excel, Microsoft Excel. So I was familiar with it because I’d done some work experience. I’d seen other people use it, but I didn’t really know how to use it myself. And I thought, well that can’t be so important. So I’m just gonna apply and I thought I probably won’t get an interview anyway because I’d had so much rejection already. But as luck would have it, I did get an interview and I went to this interview thinking, oh no, I don’t know how to do Visual Basic, but let me quickly swat up and so I read the theory on this and bear in mind, this was in 95, 96. So this is before the Internet and all that. And as luck would have it, I went there. My interview was going really well. It was a Friday afternoon going really well and it came to sort of at 10 to five and he hadn’t asked me anything about Visual Basic and I’m thinking maybe, I will just get through this interview without making a fool of myself. And then he said to me, so I’m gonna test you on your knowledge of Visual Basic and I thought, oh my God. Sat there feeling oh my God, just turning cold with panic and then he said, but it’s very late on a Friday. So I’m gonna give you the test and you can work on it on the weekend and then we’re gonna meet again on Monday and then you can show me what you’ve done. I’m like weak with relief thinking oh my God, thank you God. And so I go home and I work on this test and I kid you not I had to give myself a crash course in Visual Basic programming. But I cracked it in the end and I spent about 17 hours working on it over the entire weekend. Managed to get my solution even formatted it beautifully. I thought it was like a proper work of art and then I went back on Monday, I was really proud of myself and really excited. On a disc, I had my solution. So I gave it to him and he said, so tell me how long did it take you to do this? Tell me honestly. So I said about 14 hours and he said, well, it should have taken you 20 minutes. So I didn’t get the job but here’s one thing. For the first time ever, I left that meeting not feeling bad that I didn’t get the job because I suddenly realised I had just taught myself something that I had no idea how to use. – And if he had given me a chance, I would have taught it myself and I would have done the job somehow. And that to me was a breakthrough because after that, I never ever didn’t say yes to something because I thought I don’t know how to do this. Ans since then in my coaching business, I have launched webinars, I’ve done workshops having never done them before, thinking I can do this I’m more ready than I think I am, and that’s always been the case. So for me, that was a big breakthrough that came through failure and rejection but I turned it around and I sort of changed the way I thought about myself and my abilities thereon. – I think going back to that story, what was interesting is that, that may sound like a random little story of mindset change, but actually that thing I learned to create Visual Basic Macros actually was responsible for why I was able to create a niche in my career doing UK equities and arithmetic basis. I don’t want to go into the details, but I spent three years creating a model which proved to people that this worked and I could not have done it if I didn’t know how to use Visual Basic. – So these things. Whatever you learn, I always think that anything you learn, even though there’s like a waste, it never is because you can always find a way to use it. – Oh my God, that’s such a, this is such a good ending of that part of the story. It’s like it reminds me of probably you have seen this. The talk from Steve Jobs about connecting the dots at Stanford University. That I believe is a brilliant example of connecting the dots. So now, let’s look at people that want to make their own breakthrough. Now, we all as entrepreneurs, we want to make our breakthroughs. We have breakthroughs consistently and we need to have this consistent breakthroughs because technology is moving really fast. The business world is consistently changing. What was working yesterday is not gonna work tomorrow and we don’t know then what’s going to work tomorrow at all. So there are all these question marks in such an evolving fast paced industry which we are in. So how can people, entrepreneurs in particular start creating their own breakthrough? Maybe things that they feel stuck that they just think that is too big for them? – Yeah, so there’s a couple of elements to that. I actually want to think about the kind of products and the companies that actually have become synonymous with innovation and breakthroughs. So if you think about Apple or Google or Tesla. I mean these companies, the reason they come in or even companies like Airbnb and Uber, they have come in, they have disrupted the status quo. They’ve come up with a very sort of innovative new way of doing things, which initially may not have worked, but they have created a whole new market. Now, we understand that when it comes to business, but we often don’t do that for us as individuals because we get comfortable. We get wedded to something that we created and we don’t wanna say goodbye to that and start again. So I think to really genuinely create a breakthrough and to always be relevant and maybe ahead of the curve, we have to think about three things. One is we have to think about what I call proactive maintenance. That’s a kind of a big word but essentially, looking within yourself and think, what’s not working? What can I fix now before it gets really bad? So whether that’s your health or what is your skill base, or whether it’s your mindset. So proactive maintenance. Second is innovation. So think about the things you’re already doing. How can you do them better? So constantly looking to improve and develop yourself and develop the product and your offering and the third is to be willing to disrupt and that means sometimes, and this sounds horrible, but be willing to kill your own babies. It’s such a horrible expression but what it means is that you create something and then you have to be able to take an objective view and agree that it’s not working anymore. So it’s like me sort of saying goodbye to my career that I thought I would do for life because I loved it so much. And I looked at it dispassionately. It’s not working for me anymore. Okay, I have a lot of financial security and it’s gonna be scary to say goodbye to that, but for my own sake and for my own future happiness, I have to do this. So I think we have to do that. So I think if we can always find ways in which to have those three elements in our lives, then we will be constantly creating fresh breakthroughs and getting ahead. But sorry, before I finish, but the reason it’s hard to do that ourselves is because we don’t always see ourselves the way the world sees us, which is why sometimes it’s really good to have someone who’s a mentor or a coach or someone who’s like your cheerleader, who can also be objective and tell you the truth. To tell you listen, this is not working. You’re not as good as you used to be. You need to make a change. – So let’s explore a bit more. Okay actually before we move on, can you please repeat again the three elements because I think it gives us a chance to all our listeners to take some notes because they were really powerful. So let’s recap of the three elements. – So the first one is proactive maintenance. Now that’s a term that’s often used by manufacturing companies that have factories and so for instance, we had a burst water main and Thames Water came and fixed it. Now in an ideal world, Thames Water would have the ability to check to see any pipes that are showing some form of weakness so they could go and fix it before it bursts and causes lots of disruption. – So the same analogy works for us as human beings. Our body will often give us little signs that we’re not feeling good or the business is giving little signs maybe customers are not coming back to to our shops anymore. There’s always signs, but you need to have an open mind, and your eyes and senses to recognise your signs and then do something about it. – Proactive maintenance. Second is innovation. – So don’t get comfortable with what you’re doing today because what makes you great today will probably not be good enough tomorrow. Someone else is gonna come along and do what you do even better. – So you have to find a way to constantly find new ways. Speak to your clients. Get feedback from your clients. What do you love about what I do? What can I do better? I always do this, every single event I have a feedback form and wanna know what I can do better. So innovation and the third one is disruption. Because what’s very clear is that there is a lot of disruption that other people are going to wreak havoc in our lives. So your competitors are gonna come along and they’re gonna either undercut you or give something else, which you are not giving. So why wait for that to happen and then you react to that? Why don’t you disrupt? If something’s not working anymore, just close it down and start something fresh. But do it in a way that doesn’t feel too dramatic. So if you’re always doing little bits, then it’s a compounding benefit of small changes which can lead to exponential growth, which is where you’re all about. – I love the word exponential growth. I love that word. So I would love just to dig a bit deeper for a moment, in the proactive maintenance. ‘Cause I do a lot of interviews with a lot of experts and we often talk about the disruption, we often talk about innovation which is in the realm of making things different. But what we’re saying here in terms of proactive maintenance, is actually making what we are already doing work that works, work even better. Do you have a framework or can you give an example on how can we do this? Can we do this in our business, in this case, if someone is running a coaching business, how would I know the things that are working well and what can I do to make them work even better? – Yeah, so there’s a number of elements to that because you’ve gotta think about the resources you’re using. So you resource obviously is your time, it’s your money, but it’s also your personal health and wellbeing. So if you find that in your current job, you’re working flat out. You’re working like seven days a week, maybe you’re doing 12-hour days, you’ve got no time for yourself, then chances are you’re slowly burning out. Maybe you’re making lots of money, you’re feeling like you’re doing lots, ’cause you’re always busy, but chances are you’re actually slowly wearing out the thing that’s your most precious resource. So you need to be able to willing to stop, step back and just look at yourself and think, is this really how I can carry on building my business? – If not, then what changes can I make? Then of course you will think about individual things like how can I make my time more productive? How can I do more in the same time? Maybe I can outsource stuff, maybe I can delegate, maybe I can build a team and not do everything myself. Maybe I could do some things differently because actually, they’re not really adding value to my clients. So it’s all these little things and I think that’s where, having someone like me, or has someone like you to come in and give somebody an external perspective on how they’re doing things now can help them do that proactive maintenance. But I think the most important thing is to listen to your body ’cause I think the most precious thing is our health and that’s the bit that often suffers. When people become suddenly very successful, they become so caught up in being at different places, different times, being at different talks and things like that, that they don’t pay attention to what their body may be telling them. – I know this very well. – I don’t know how you do it. You’re just like you’re amazing, like a Duracell battery but even they run out at some point. – That was my biggest and still is the thing that I’m struggling the most with. I think it’s just been consistent for me. The fact that work has never been a problem. If I find something I love, I’m just gonna work and I don’t care if it’s gonna take me 48 hours straight, I just don’t feel it. But what I feel is the aftermath after that. And so things started changing for me when I got married because my wife is completely the opposite. And if it wasn’t for her, I would probably still doing what I kept doing for many years. But she’s just like, I wanna go on holiday. I wanna chill, let’s relax. But I’m working. Shut up, close the laptop. Come and chill with me. So that’s the kind of, that’s what needed to happen for me to make that shift. And I think there is still improvements that can be made on the battery. – I think she was the catalyst for you, wasn’t she? – I totally agree with you. So now we are going towards the end of the interview. Now Rohini, you have been a GTEX member, GTEX lifetime member for a while. What made you join GTEX? What did you find in GTEX that said, okay, that’s the place for me? – I think there were a number of things. I think I felt that the community was very, there were lots of like-minded people, which is something that you miss when you go into business on your own because you don’t have the camaraderie of maybe colleagues and the same kind of opportunities to chat with people who are not necessarily competing with your direct. So that was lovely. But I think also people that run GTEX and including you and Raj, Ben, Caroline. I think these people bring in expertise that is very difficult for someone like me to access separately. 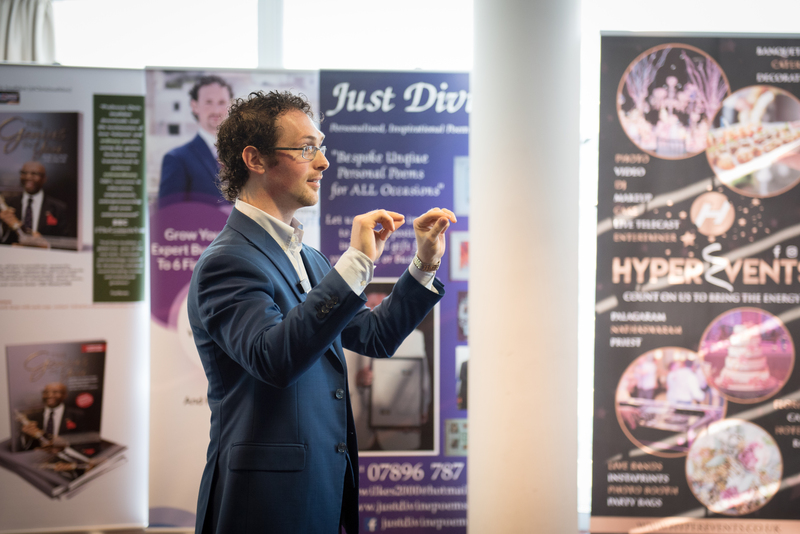 It would cost a lot more money and take up a lot more time to find the right experts to give things, like the advice, like that kind of workshops you hold have been such great value for money for me anyway, giving me so much more clarity. And then of course, you spoke once with Caroline, having Raj to guide me as a coach. So I think all of those put together and I’m sure there’s a lot more that I have not even scratched the surface on. All the courses that you first spent time creating but I’m not somebody who actually just goes and consumes the stuff. I go when I need it ’cause I’m one of these people, like as I said to you earlier, I look at an opportunity, I think I’m gonna do this. Okay now to do this, what do I need to learn? And then I will go back and see, okay, what have I got in terms of resources that I can use and then I will learn it because then I can apply it immediately. So I don’t know if that answers your question. I think for me it was a great sort of one stop shop for lots of things, including some incredible friendships that have already formed. – Thank you very much for sharing and if you want guys to learn how you can become a GTEX member, then there is a link here if you scroll down here in the show notes. You can book a call with our awesome Sephora and she can tell you what’s on offer and how we can support you and your business. Now, getting back to you Rohini, I want to, before we leave, we want to lift the veil. And this is the part of where I ask all my guests to share an app, a book, a resource or a tool that you’re using to make your life and business better. What’s that for you? – For me, there’s a couple of books that I’ve read that have really changed my life. Can I mention two or is it just one? – Of course you can. Of course you can. – So one of them is a book by Dr. Joe Dispenza and is called You Are the Placebo. And some of your listeners may have already read it. To me, it was actually interesting ’cause I was challenged by a client of mine because when I talked to him about visualisation, he wanted proof the how does this work? So I tried really hard. I kind of gave him some material to read and he was just not convinced. He was not convinced. In the end, I kind of parted ways with this client because I felt that I couldn’t work with someone who was always questioning me, who wasn’t willing. But what he did give me was a really huge gift. And he told me about this book and he said, you should read this book because it will answer the questions that I was asking you, and it is an amazing book and it basically tells you the power of the mind to create a life you want. And this is something I’ve always believed in. I’ve done this for myself, but I never really understood the science behind it and it’s a wonderful book that bridges spirituality with science. So I think whichever side of the coin you sit on, it’s an amazing book that does both that. – Can you repeat the title once again? – It’s called, You Are the Placebo. – Yes, you Are the Placebo. – By Dr. Joe Dispenza. – Perfect, and the second book? – The second book I’ve just finished reading and it’s called Shoe Dog by Phil Knight, who is the founder of Nike. – Have you read that? – Not yet but you are not the first person who mentions it in a few days. So it’s a kind of a sign of destiny for me to read it or listen to it. – I would say, listen to it, ’cause I actually listen to the audiobook. The narrator is absolutely brilliant. It’s a book about business and it’s his story, but he gave me goosebumps. It’s so beautifully written and it’s such powerful messages. Sometimes people say business is all about money and you’ve gotta listen to his story and it tells you that business is, the day your business is all about money is the day your business is in trouble. That’s what he says. It should never be all about just about money. it’s a great book. – Awesome. So Shoe Dog from, what’s the author again? – Awesome. So you can scroll down, there are going to be those titles here in the show notes so you can download them. Now, it’s time to wrap up Rohini. It’s been a pleasure having you on the show. If people want to reach out to you, get to know you, work with you, what do you have for them and where can they get in contact with you? – So they can get in touch with me via Facebook. So I have my own personal page, but I also have my business page, which is actually under my name, Rohini Rathour. They can also get touch by LinkedIn ’cause I’m on LinkedIn as well. I do have a Twitter account, but I don’t use it very much. So I would probably not suggest that one. And of course, you know my website, which is, you’re probably going to put the link at the bottom so you can email me through my website as well. – Fantastic. So make sure you get in touch with Rohini, attend her amazing workshops. I was recently at one of her latest workshops around Powerful Communication and it was a very powerful, using the title of the workshop to see how we can communicate better as human beings. Because it all evolves around communication. I would think we do with your clients, to get to new clients and communication is not one of the skills that is often thought well enough. So I absolutely love attending as well your workshop and being there and I know you’re going to do more of them. So make sure you check out Rohini. See where their next worship is gonna be and then sign up there. Rohini, it’s been an absolute pleasure. Thank you very much for being on the show with us. – Thanks for having me Simone. I really enjoyed this. – It’s my pleasure and thank you very much ladies and gentlemen for listening to the show. Now, if you enjoy there is only one thing you’ve got to do. Actually two things. One is the subscribe. I know that button is calling you so click. Click that subscribe button and also leave us a review. It will mean the world to us. We put a lot of work in finding the best guests and creating the best content for you, so it would mean the world to me if you can leave us a review on iTunes and let us know what did you enjoy the most or what else you would like us to cover. And then if you’re sending me the screenshot we’ll let review in my email, which is simone@gtex.org.uk, then I will send a little gift. It’s a surprise. So thank you very much for listening and remember, that together we grow exponentially. Ciao.